Here goes; as promised, the first of the delish vegetable dishes that accompany the baked halibut. The pumpkin recipe will follow. Of course, you can enjoy the halibut with lots of other dishes, but these seem to go so well. 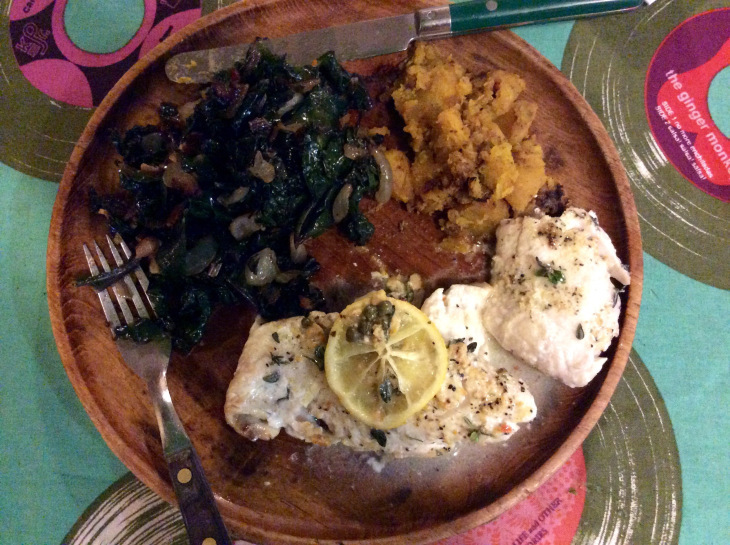 The kale is tangy and savory and the spicy, richness of the pumpkin complements both fish and kale. 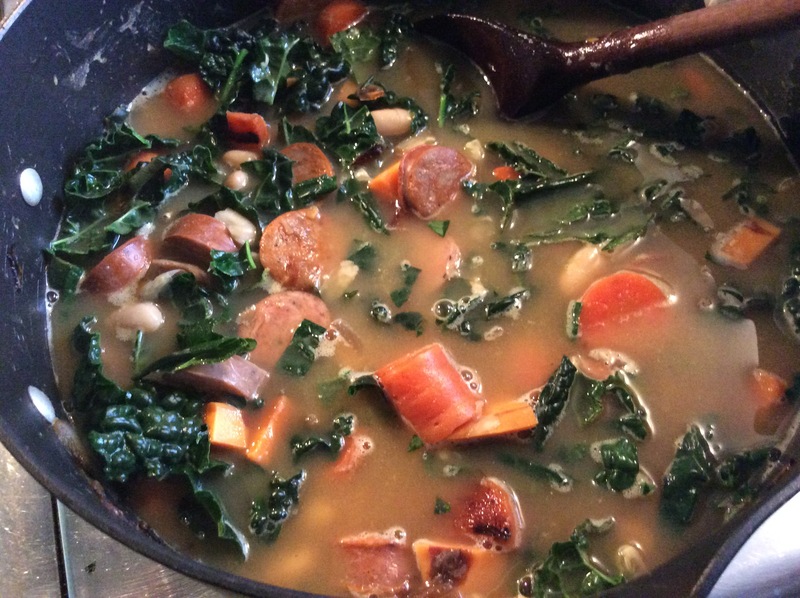 Plus I like the mix of colors — after all, we eat with our eyes as well as mouth and nose. And as always, low carbs rule! 1. 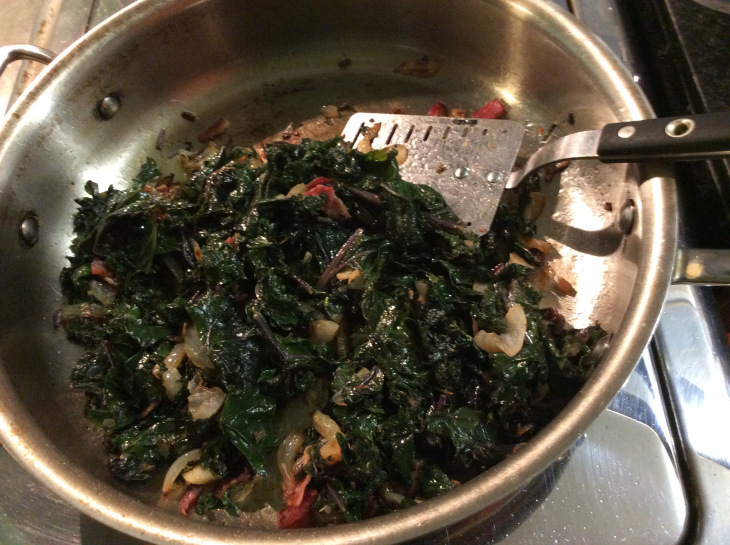 Wash and then strip kale leaves from stems. 2. Discard tough ends and woody stems and chop more tender ones into 1/2 -1″ pieces. 3. Chop leaves into 1″ pieces. 4. In large saucepan (we use a large aluminum All Clad) fry bacon til almost crisp; add olive oil and onion and cook til transparent. 5. Reduce heat to low. Add stems and sautée about 7-8 minutes. 6. Add leaves and sautée about 10-15 minutes more (cover for 10 minutes, but check to make sure not burned); turning mixture occasionally. 7. Taste for tenderness, and serve. Be sure to follow my blog for the spicy pumpkin recipe!